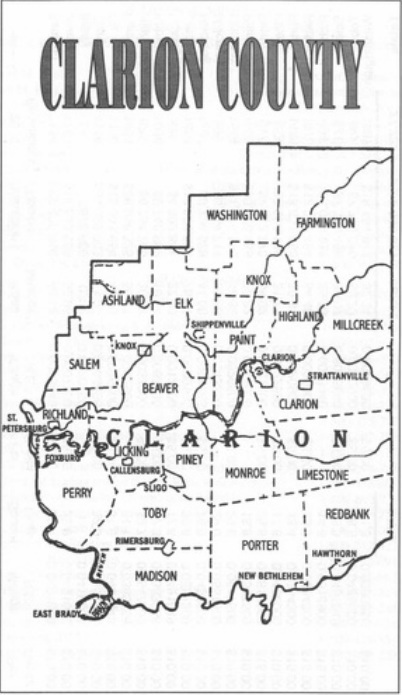 Clarion County was formed in 1839 from segments of Venango and Armstrong counties. It was named for the Clarion River and is the 54th county to be established in the state of Pennsylvania. In its early days, Clarion County grew in population due to the growth of the iron, lumber and oil industries. Farming was also a source of livelihood among residents. Clarion County covers over 600 square miles of land in Northwestern Pennsylvania and has a population of nearly 40,000. Today, 22 townships represent Clarion County: Ashland, Beaver, Brady, Clarion, Elk, Farmington, Highland, Knox, Licking, Limestone, Madison, Millcreek, Monroe, Paint, Perry, Piney, Porter, Redbank, Richland, Salem, Toby, and Washington.